With new calves on the ranch, “Magic the Donkey” should be on high alert. This year, he’s in timeout instead. For several years I’ve had donkeys intermixed with my cattle for a specific purpose. As social/herd animals, donkeys make wonderful guards against predators such as the coyotes that are so plentiful here in Texas. While donkeys are playful animals, they are fierce protectors of their territory. Whenever a coyote or a strange dog wanders into their pasture, they bray, stamp their hooves, and attempt to stomp the predator. 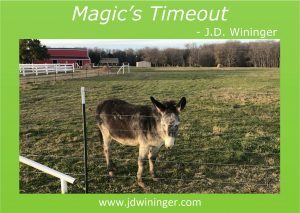 Magic is a gelded male donkey, and he and his mama Molly patrolled my pastures since 2013. Molly died this past fall—leaving Magic as the sole guard for my herd. I observed him the first couple of months after his mama died to ensure he would be okay. Donkeys tend to play rough. They bite each other’s necks and backs, which is why I think God make them with such thick necks. Conventional wisdom says male donkeys and cattle don’t mix. It seemed he would be fine remaining with his “cow family” as I kept him with expectant cattle. After the calves arrived, I noticed a change in his demeanor. Magic was always calm around the larger cows and yearlings. When I placed him with the young calves, the trouble started. I found that my normally calm donkey was behaving more aggressively. He tried to separate the mamas from their calves; and when I caught him chasing calves, I had to act. I tried him with other, larger, cattle with much the same results. For the past month, I have placed him in a timeout. In his own pasture, he can see the others through the fences. His barn stall is next to where the cows and calves bed down at night. I’m hoping he’s had time to reflect on his situation and will behave himself. I may try him with the cattle again, but I fear he will remain too aggressive. If he remains aggressive towards the other animals, I will have to make a decision. Options include getting a jenny (a female donkey) to give him a companion and help calm him down, leave him separated, or find a new home with other donkeys. All this causes me to consider how important it is for me to take time and reflect on my attitudes and what changes I may need to make in my life. My best approach to do this is by praying. Prayer enables me to connect one-on-one with God. It is in this “connectedness” I am most open to the Holy Spirit’s leading in my life. By reflecting on my attitudes, thoughts, and opinions, He can help me identify where my carnal, secular human nature takes precedence. It is during these times I ask God’s help to make me more like His son and less like this world. I pray each of us remember to place ourselves in a godly timeout now and again, so we might see how our behavior impacts our testimony. Good job and a cause for reflection. This ol’ goat won’t be chasing any heifers for sure, but some matters in my behavior are sure signs of my old nature and thanks. Thanks Mr. Terry. I’m not much for chasing them around any longer either. That’s why I have an ATV and “Bubba the chocolate lab” my friend. I love learning new things, and I always learn something new from your posts! My vote is for getting Magic a girlfriend. 🙂 — I like the idea of taking a time-out to reflect on our spiritual behavior, especially when we get so busy with life we neglect thinking about our connection with God…or when we get in a spiritual rut and don’t realize we are just going through the motions. Thank you for leading our hearts today! Have a blessed day! Thanks Ms. Karen. I too get far too busy for my own good some days. Thanks for sharing your wisdom with us today. God’s blessings ma’am. How’s Mr. Russ enjoying his retirement? Busy I bet. I’ve compared myself to a stubborn mule (donkey, Englishman) many times, and have asked God for a gentler spirit, yielding, submitting. But sometimes I just need a timeout as well. An apt discipline, for sure! Hopefully Magic, and myself will learn that this is a kind thing our “masters” are doing because they love us, but care for those around us as well. Thanks for this good illustration from the animal kingdom. Of course now, I can’t help but think of one stubborn but wise donkey in the Bible, owned by Balaam. Now if Magic could only talk….. I just knew we were somehow related Ms. Jackie. Now it all makes sense ma’am. 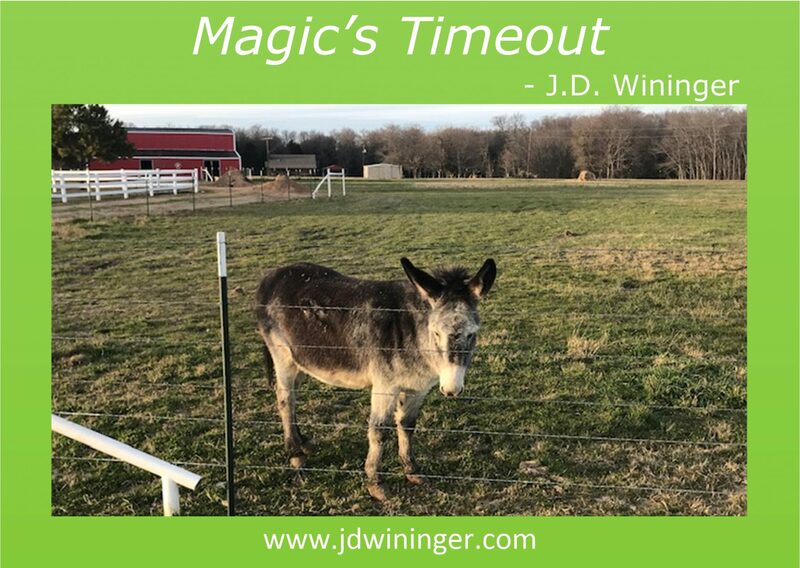 Magic gets his points across pretty well; especially when he stands outside the fence, facing my office, and braying his demands for a carrot or oat snack. God’s blessings my friend. Your analogies are so on target. And we sure do need to place ourselves in godly timeouts. This was fun to read. Thanks so much. By the way— I love donkeys and enjoy having them in some of my children’s books. I hope Magic straightens up for you! Thank you so much Ms. Connie. I have so many stories to share with you about “Magic” and “Molly” some day ma’am. They are/were certainly characters. Not sure if you’ll have a donkey in He is the ONE, but I am sure looking forward to sharing this with our Children’s Church class. And yes, we all need to take a timeout and reflect now and again. Thank you for visiting and for your comments Mr. Swindle. Enjoyed visiting your Christian poetry site. God’s blessings this day sir. I’m sure I need a godly timeout way more often than I give myself one! Thanks for the reminder to examine my heart and actions for bad behavior! Thanks Ms. Julie. Am pretty sure we all need more godly timeouts than we take my friend. I thank Him every time He reminds me to come rest in Him for a bit.